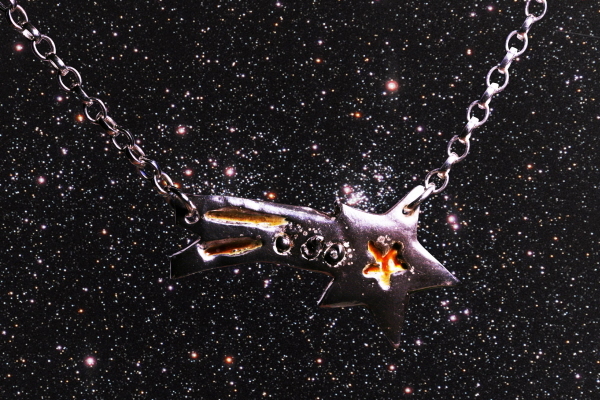 It is made with a large solid silver shooting star set with small iron meteorite fragments along the trail and then enamelled with a stunning fiery effect on the trail and also the centre of the star. The meteorite used is the Campo Del Cielo meteorite. This is a famous Octahedrite iron meteorite that fell in large amounts in Argentina between 4000-5000 years ago. The necklace measures 4.2cm in length and is strung from an 18 inch sterling silver chain and boxed in a stunning black velvet lined jewellery box along with a signed certificate of authenticity.